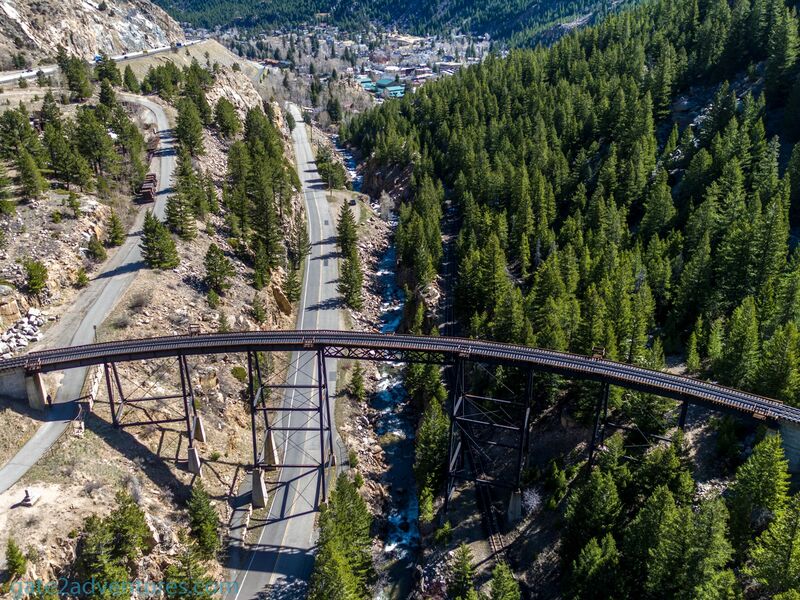 Nested high up in the Rocky Mountains is the Georgetown Loop Railroad. 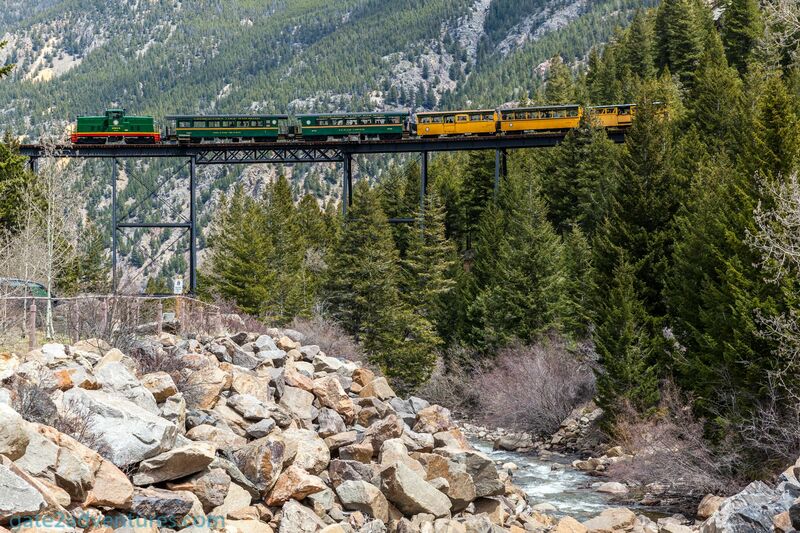 It runs between the towns of Georgetown, CA and Silver Plume, CO. 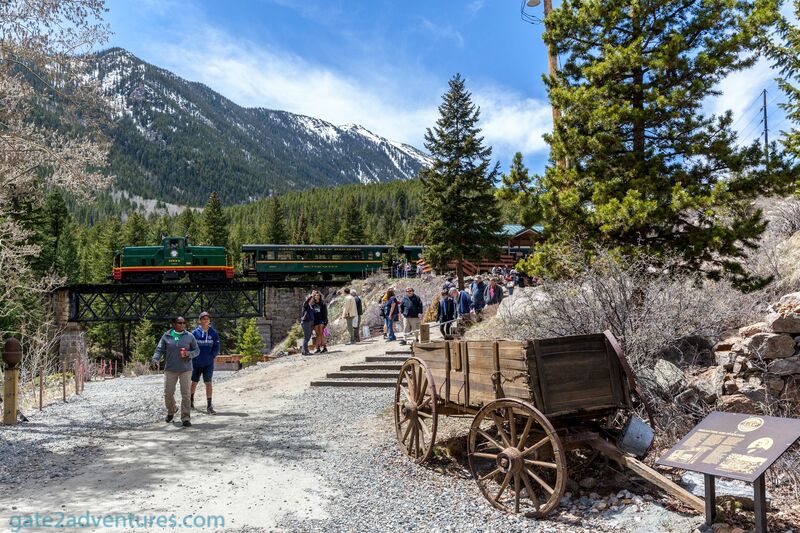 The Loop Railroad is a 3-feet wide narrow-gauge railroad and was one of Colorado’s first tourist attraction. Constructed in 1884 it connected the two cities, which were only 2 miles (3.2 km) apart. 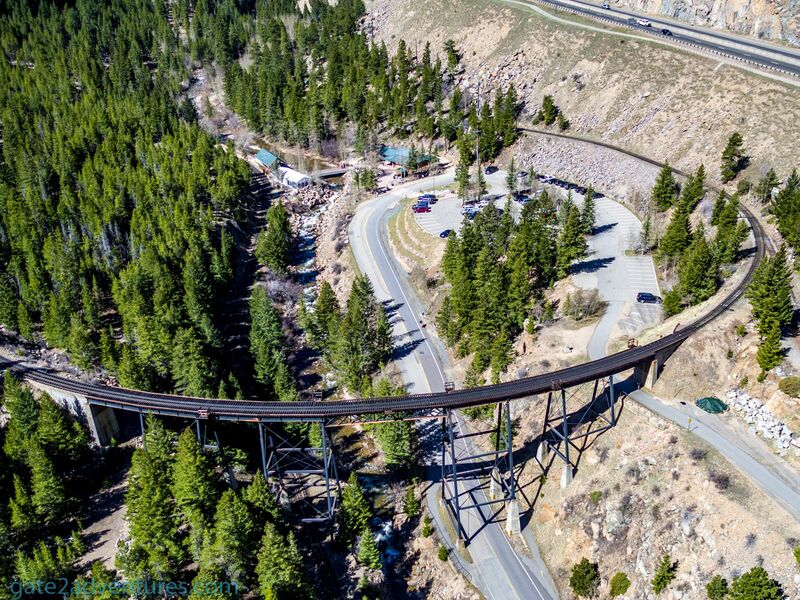 However, the railroad road is 4.5 miles (7.2 km) long and ascends an elevation of 640 feet (195.1 m) on its way to Silver Plume. The tracks run along Clear Creek and cross it four times on the way. The railroad is situated adjacent to the I-70 Interstate. 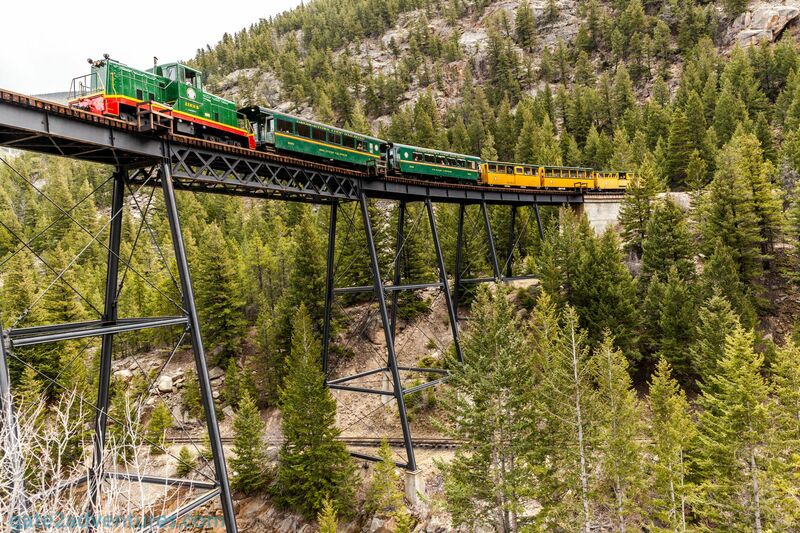 The highlight is the Devils Gate High Bridge crossing Clear Creek and looping the railroad on top of itself. 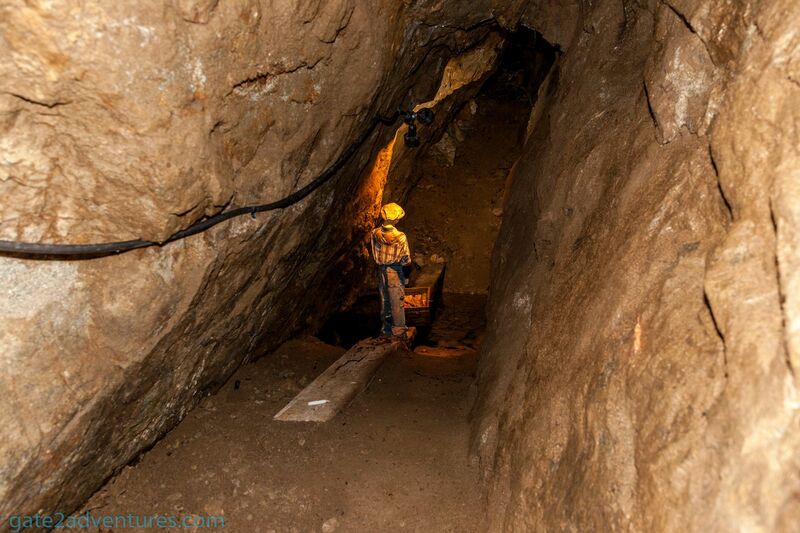 The railroad was used to carry passengers, freight, and ore as silver was discovered in the nearby mines. With increasing automobile traffic, railroad traffic shrunk and the railroad was dismantled in 1938. 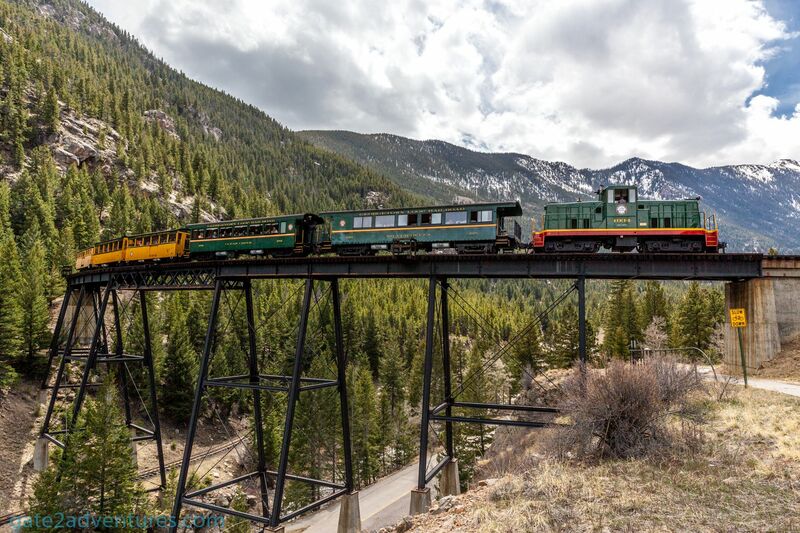 In 1973 the Colorado Historical Society began restoring the railroad and a replica of the high bridge was completed in 1984, just in time to celebrate the 100th anniversary of the original bridge. The railroad is now again once a very high frequented tourist attraction and is open from around end of April until New Year’s Eve. 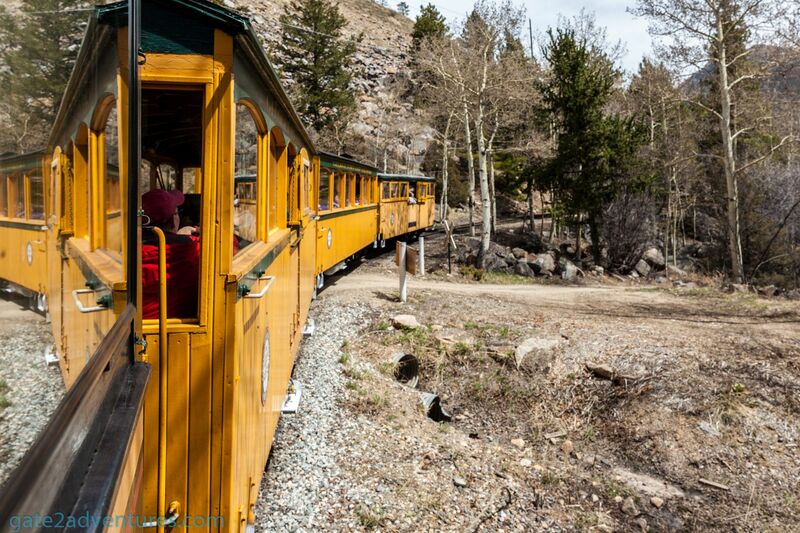 Transporting passengers between the Devils Gate Station near Georgetown up to Silver Plume. 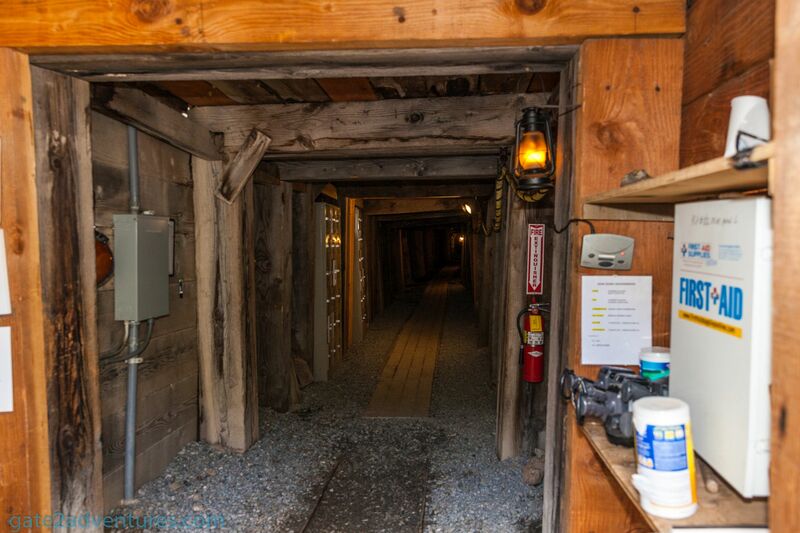 Besides the train ride, enhance your adventure with a visit to the Everett-Lebanon Mines. 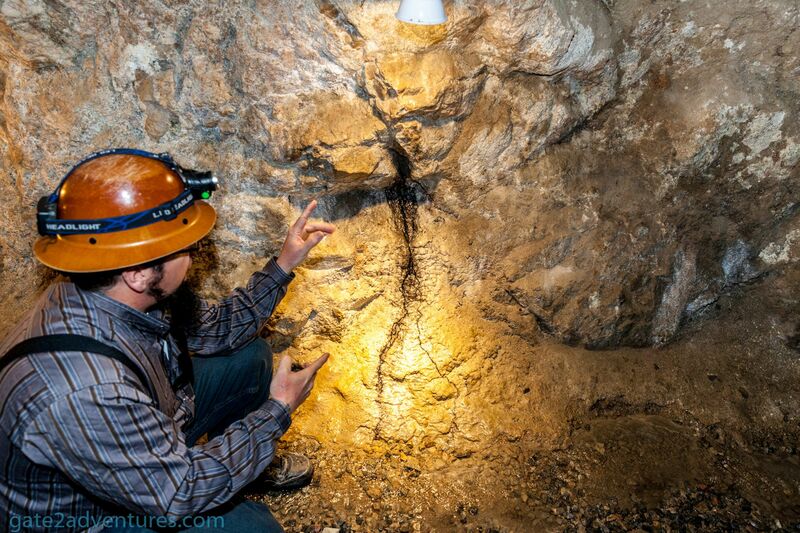 Different tours are offered and I can highly recommend the extended mine tour. 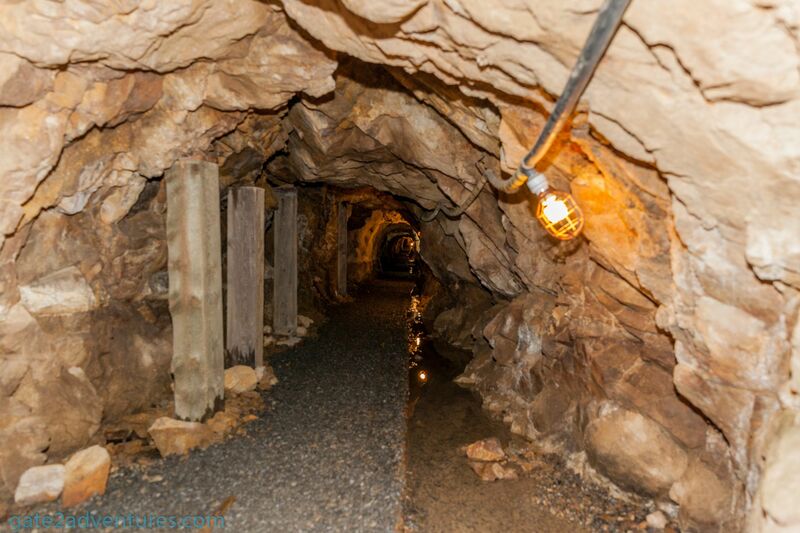 The mine tour takes you in as deep as you can go into the Lebanon Mine. 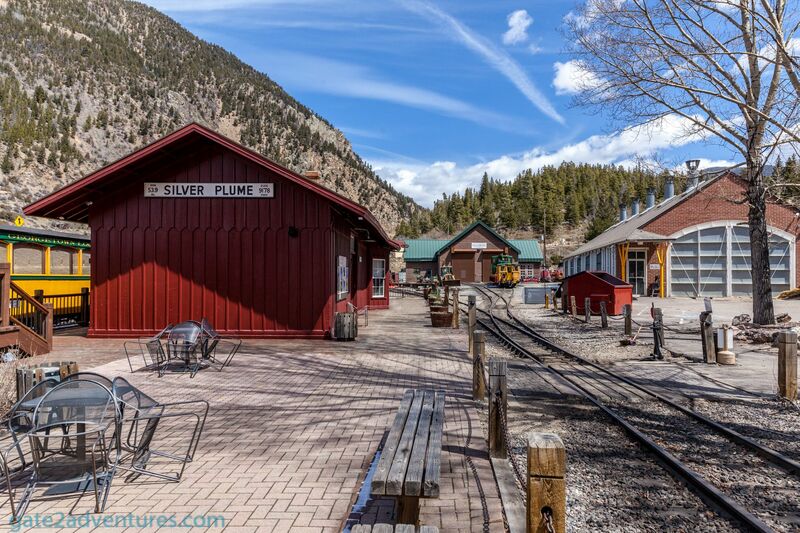 To get to the mines you will take the train up to Silver Plume and disembark at the designated station. The conductor will tell you when you have to get off. I was able to take one of the first rides after reopening for the 2018 season. 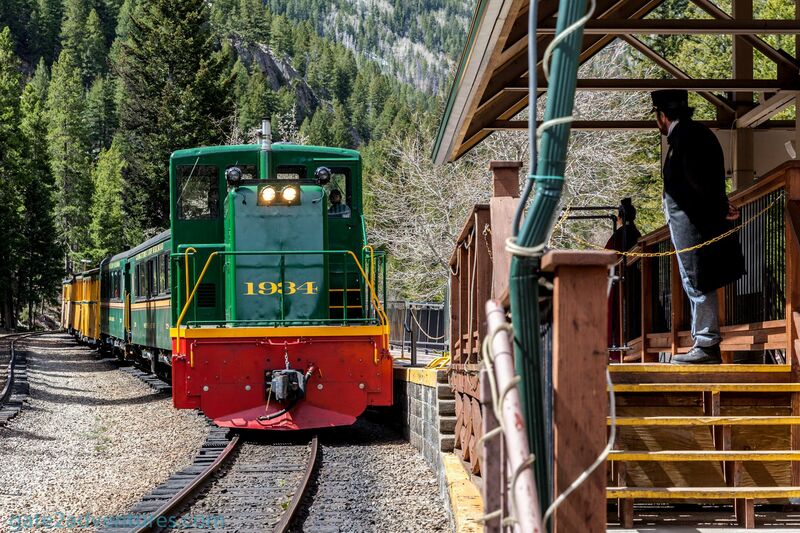 In this early stages of the season, they only run a diesel locomotive and you can only board the train from Devils Gate Station. I purchased my tickets one day ahead of time and I would recommend making reservations as soon as possible, as tickets sell out quickly and especially for bigger groups. 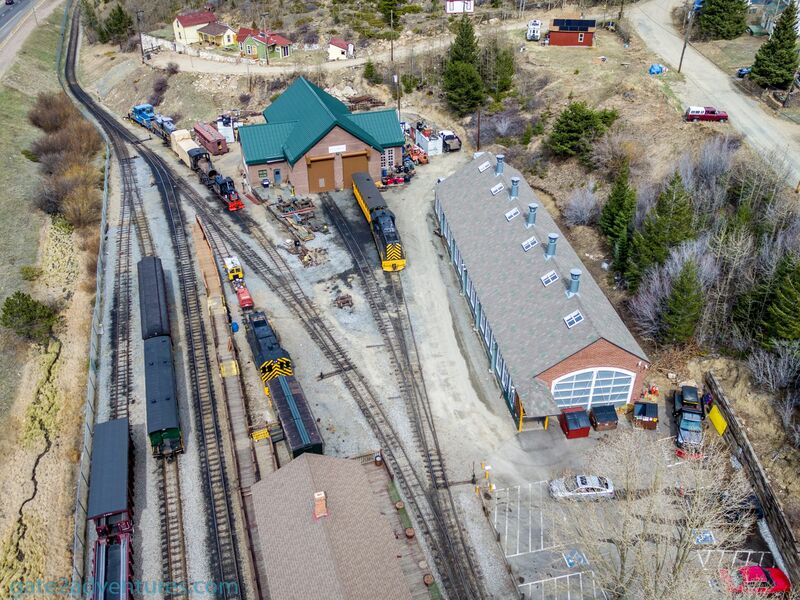 The train ride offers two classes of service Parlor and Coach and of course, I went all in by purchasing the extended mine tour and a Parlor Class ticket for just under $51. The difference between the two classes is that you get a table either with 4 or 2 seats, depending on your group and free snacks and drinks. 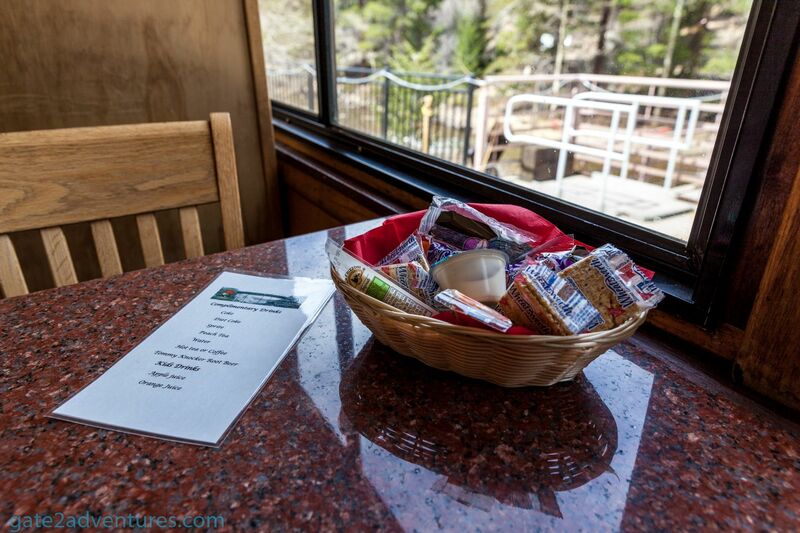 Coach customers can buy snacks and drinks if desired. 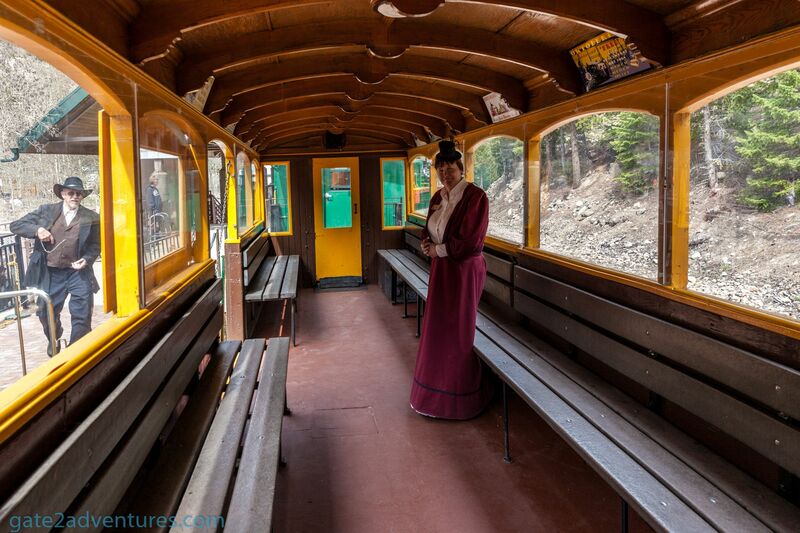 The staff at Devils Gate Station and aboard the train are super friendly and try their best to give you an unparalleled experience. After asking if I could step outside, instead of waiting in line to take pictures of the train coming into the station, I was escorted to an area right next to the tracks. 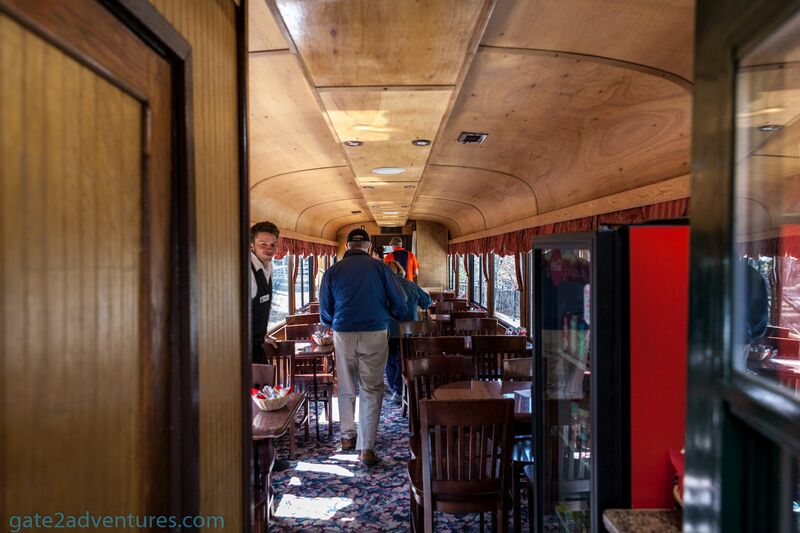 I also asked them, if I could tour the empty cars to take some pictures after we got back and everyone disembarked. The staff is just awesome. Be friendly to them and ask nicely and you are more than likely to receive a positive answer. They let me stand between the cars on our way up to take pictures as well. Just be nice and ask and don’t take everything for granted. After everyone was aboard we first went down the tracks and under the high bridge. 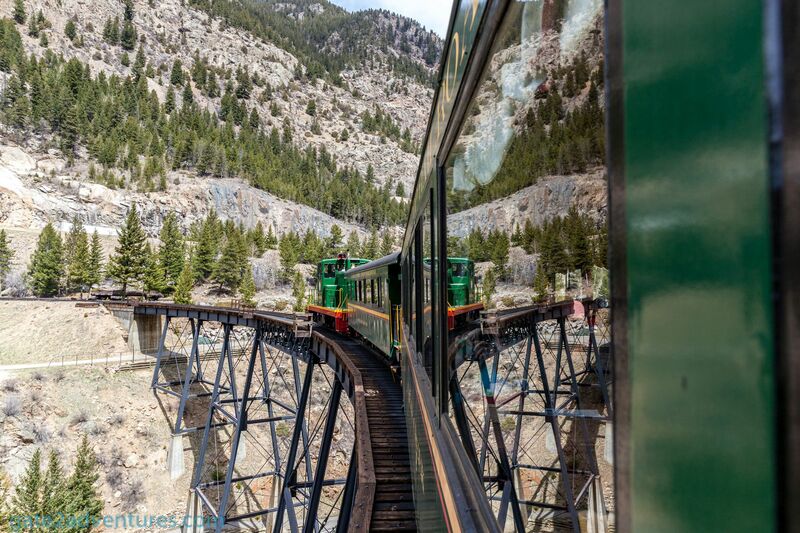 After a short stop, the train reversed and got its ascend to Silver Plume. 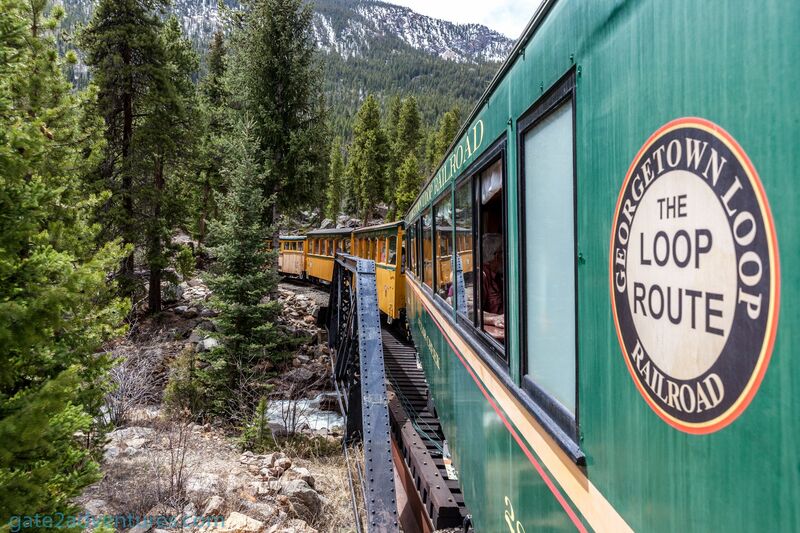 On our route through horseshoe curves and grades of up to 4%, we passed many scenic spots and crossed Clear Creek a few more times before we arrived in Silver Plume. 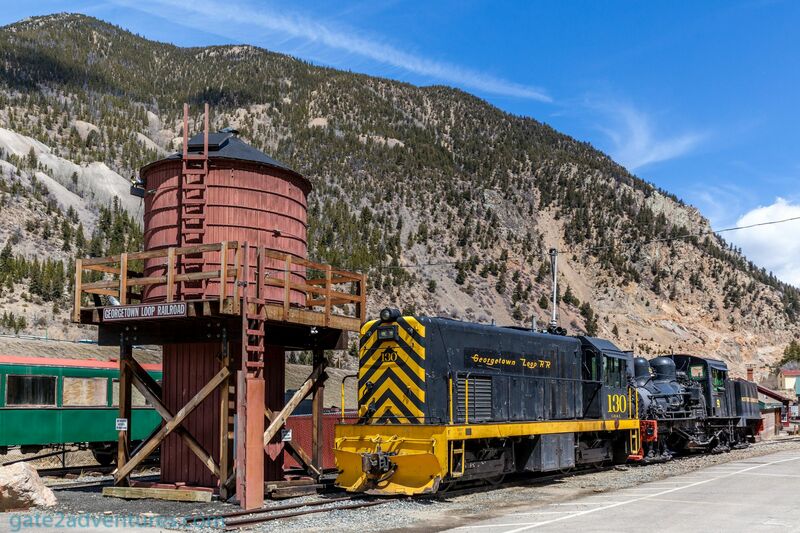 Because the Silver Plume station is not open yet, we would just stop there and would take the train back down towards Georgetown and the Devils Gate Station. Right, when the train reversed we all could feel a big shake and the train stopped. The train had a small technical problem but the crew was on it and solved the problem with excellence. 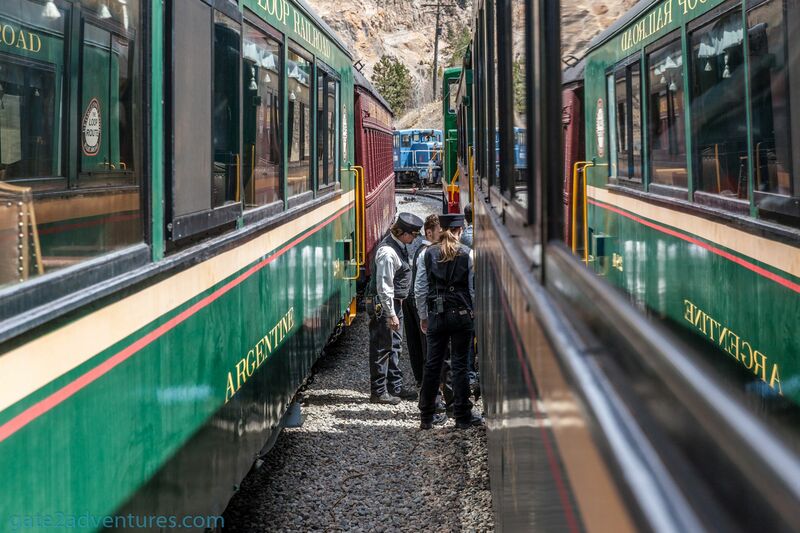 Because of that, we got an extended train ride, or let’s call it “stay”, in Silver Plume. 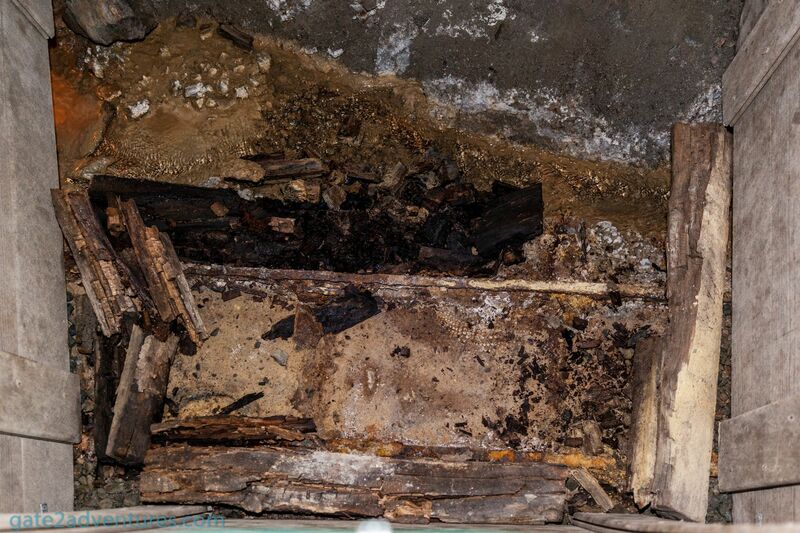 The crew offered drinks and snacks while the repair work was carried out. Don’t get upset if things like this happen. It is very old equipment and people there doing the best they can to keep it in good shape. Volunteering and dedicating many man hours for you to enjoy the train ride. Be patient! After the problem got fixed we were on our way back down and on the way to stop at the Mining District station. Everyone who added the mine tours to their tickets got off here and after a short instruction of our guides near the station we walked down to the entrance of the mines. We were split into two groups. 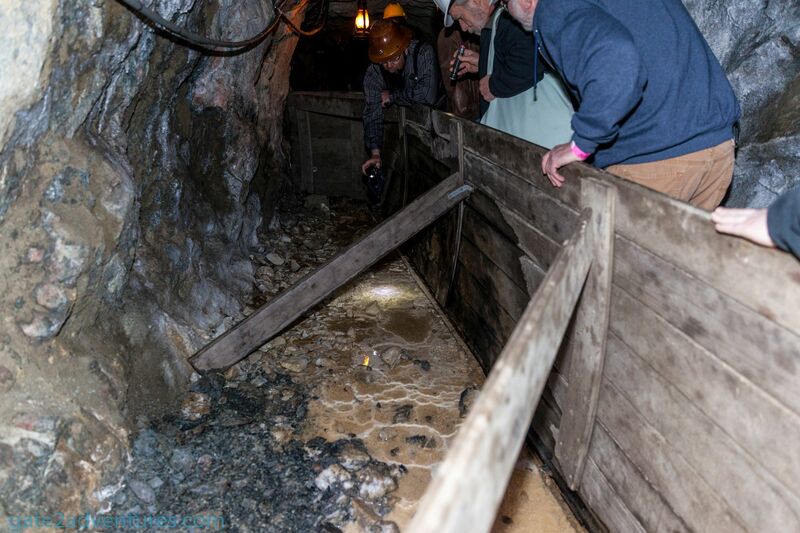 One group for the regular mine tour and one for the extended mine tour. After a short safety introduction to hard hats and what to expect in the mine, we headed in. 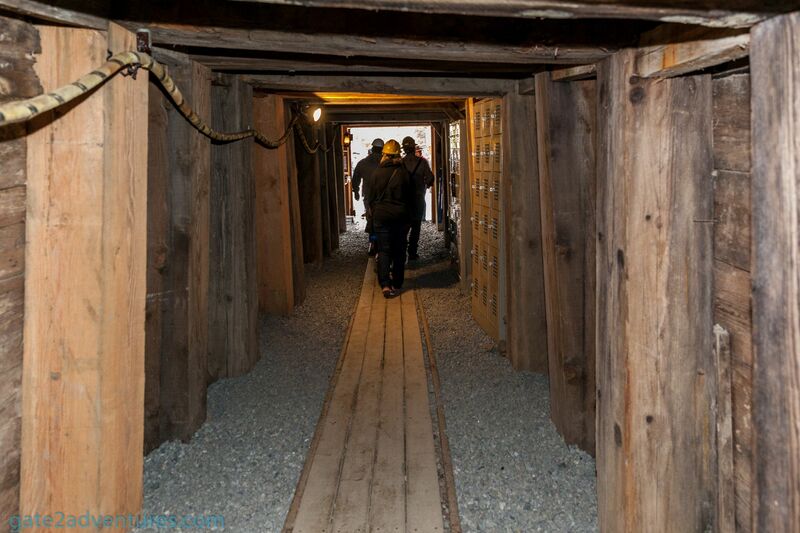 Our guides pointed out all the interesting facts about the mine and how the mine was operated back then. Like how the used children as “powder monkeys” to carry dynamite and drill bits in and out of the mine and even light the fuses. Unimaginable in today’s working world. 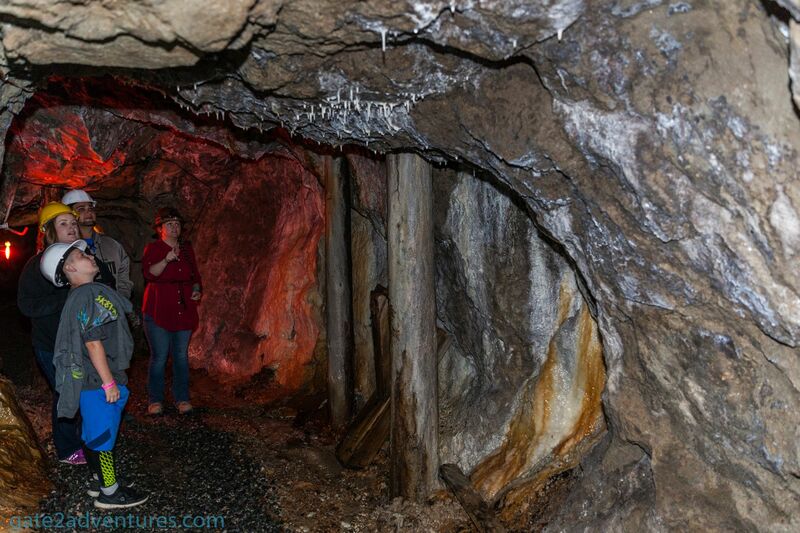 Our guides told us stories about the ghosts of the mine, the so called “Tommyknockers”. 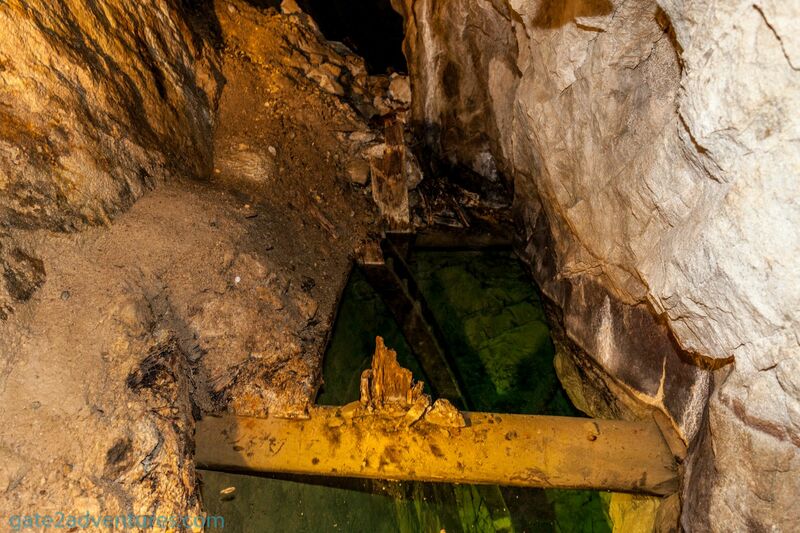 On our way in, we pass the old silver veins and shafts connecting different levels of the mine. 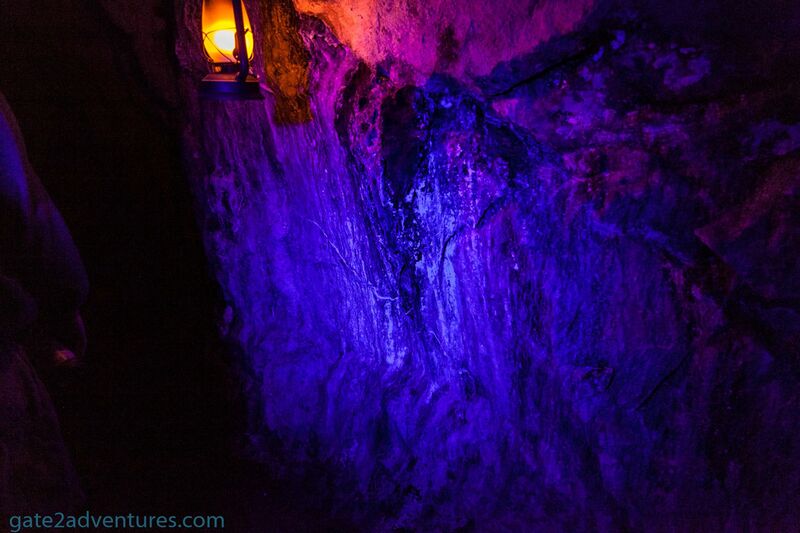 We also could see “Dragon’s Blood” which is a silver seepage line along the walls that have oxidized and turned black. We also got to see the “calcified hobnail boot prints, calcite dams, and stalactites that are over 100 years old. One of the best spots were the opening were the motherload of silver was found. 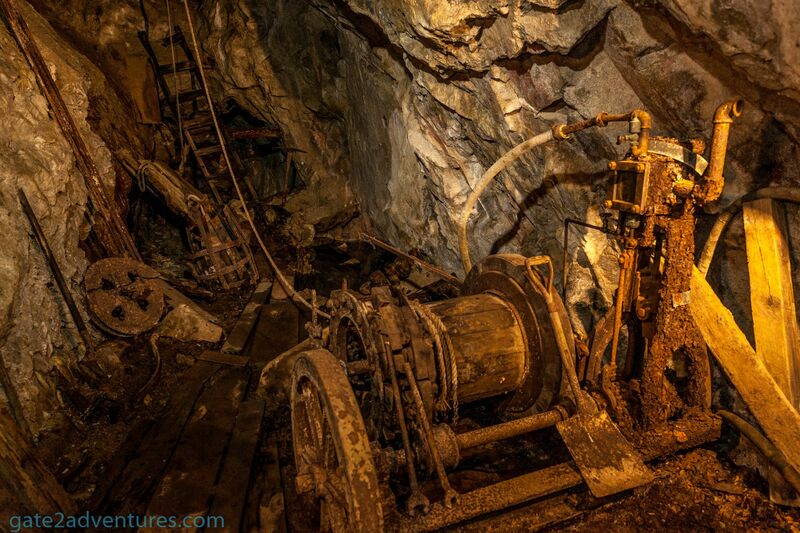 There was an old air-operated winch, tools and carts left over they used to haul ore out of the mine. We walked through the miners “breakroom” and our tour guide explained to us what miners would eat. After that, we got to the newly opened extension, which the volunteers just dug out between the end of the last season and starting off this season. 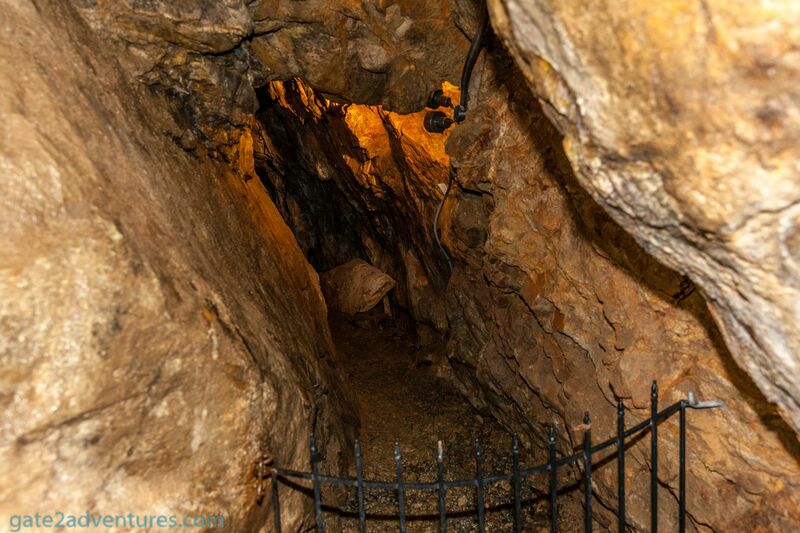 Only a few people made it so far into the mine after it opened for tourists. But they are not done yet. 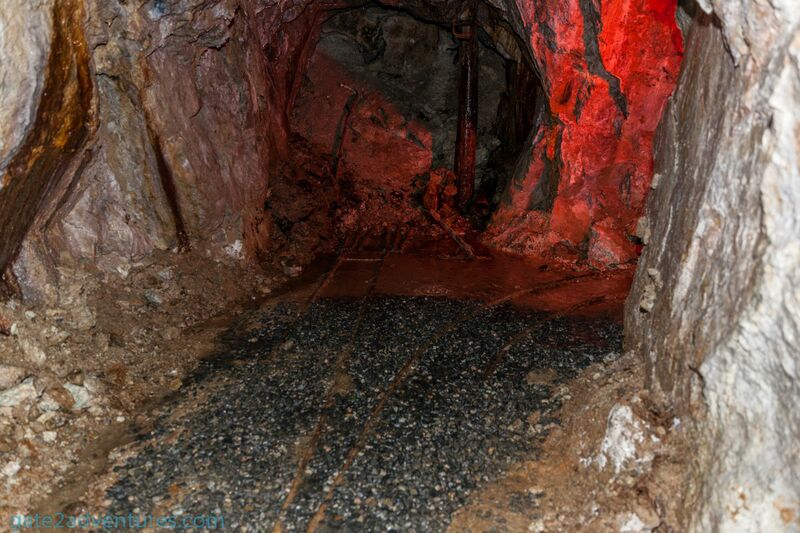 Tracks on the ground indicate that the mine goes further into the mountain. 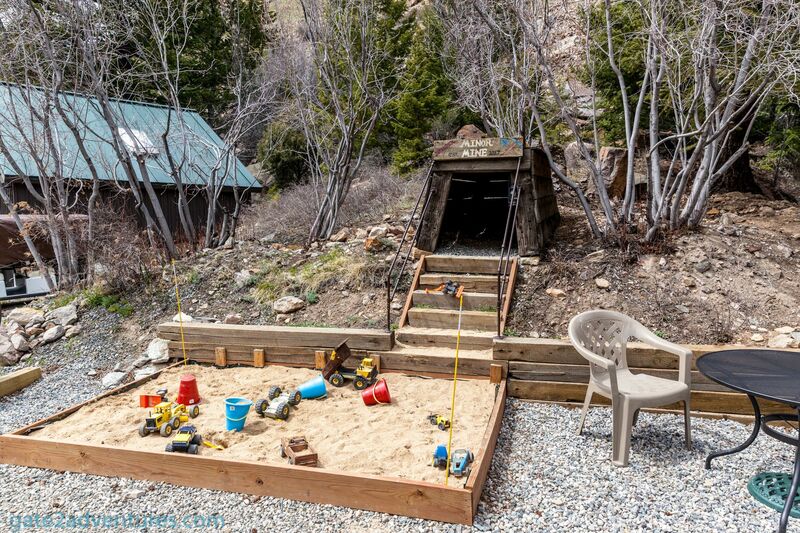 Another great part is when you get to stay a couple of hundred feet under I-70. Yes, you are directly under the interstate. The tour brought is about 900 feet into the Leavenworth Mountain. Bring a light jacket as the temperature in there is a constant 44° Fahrenheit (6° Celsius). I loved our tour guides, they were funny as hell. After we reached daylight again, we headed back up to the train station and waited for the train to arrive. 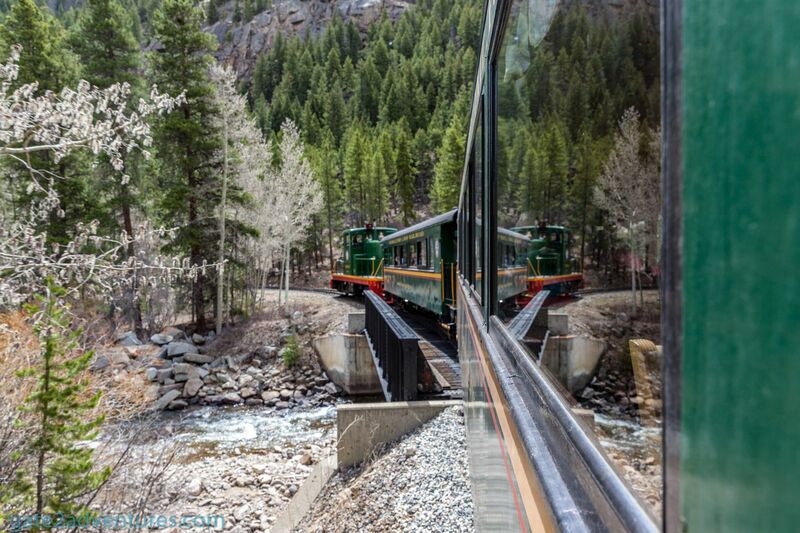 You can get great pictures as the train comes around the curve into the train station and stops on the bridge over Clear Creek. From here it was only a short train ride down to the Devil’s Gate Station, unfortunately. 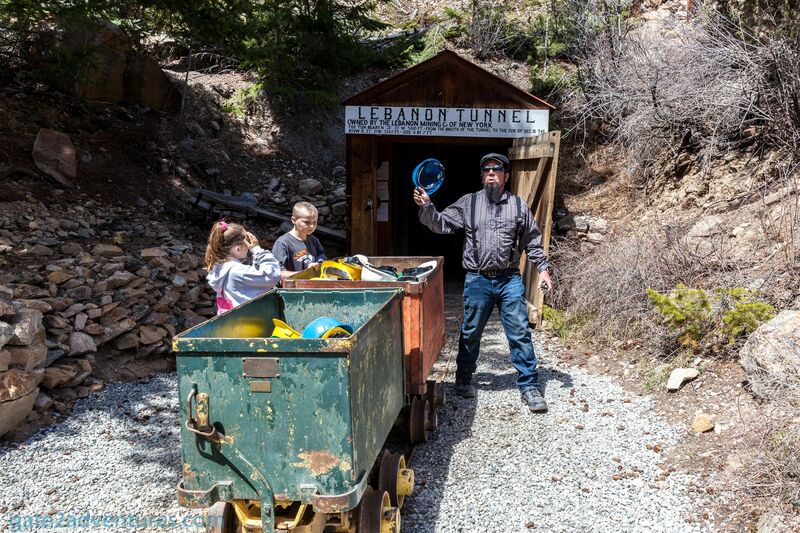 This was a great adventure and if you have time, be sure to ride the train and visit the mines. After that head into scenic and historic Georgetown for a great meal and more museums and great photo opportunities. Train rides in winter, when you have snow all over, are spectacular as well. 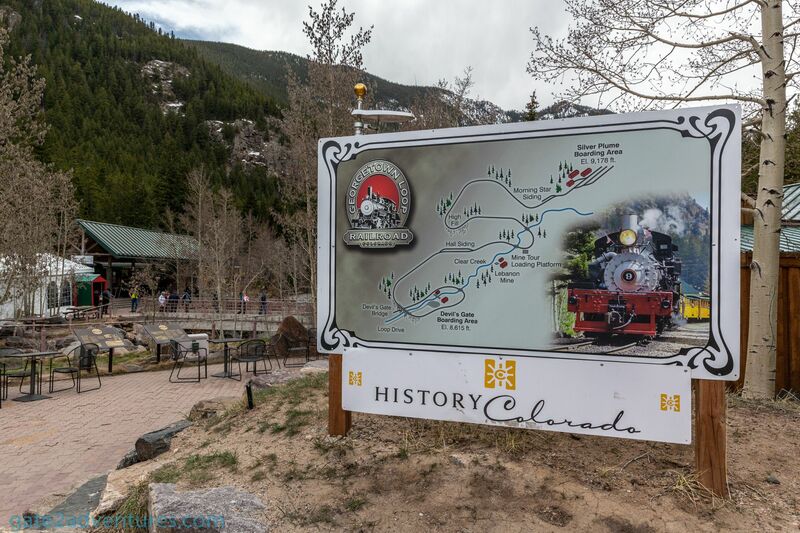 The Georgetown Loop Railroad has special events throughout the year. 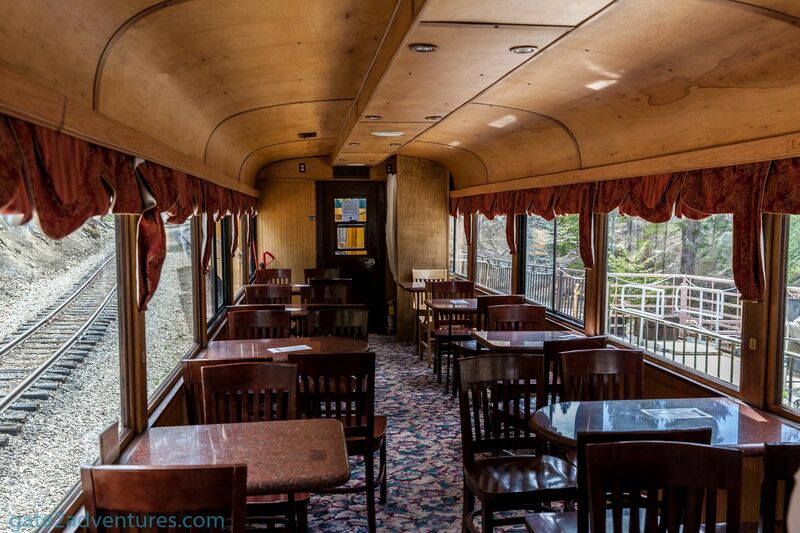 Their Christmas train rides are very popular and you should make reservations way in advance. Another recommendation! 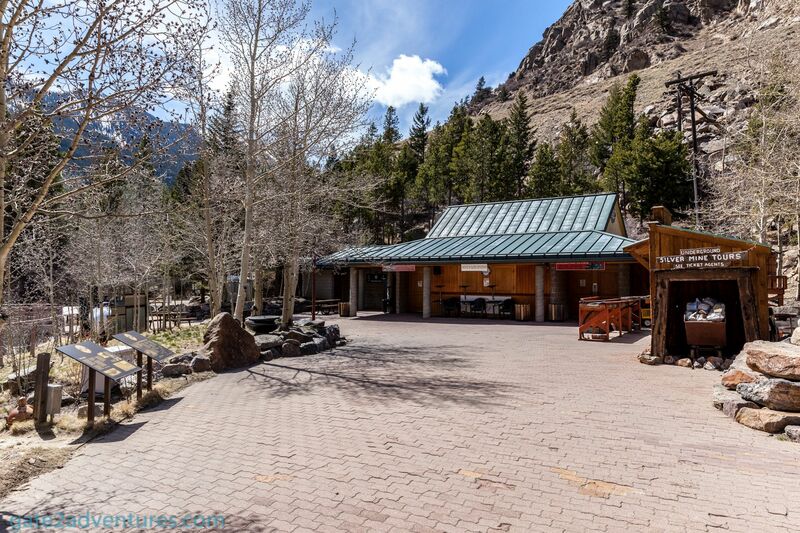 Drive up to Silver Plume and walk along Main Street. 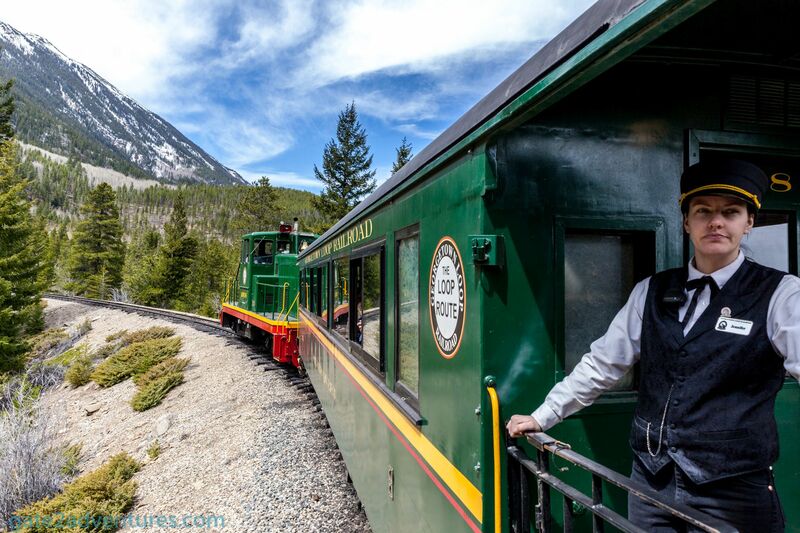 You will see old and historic houses, just as they were back during the gold and silver rush in the Rockies. 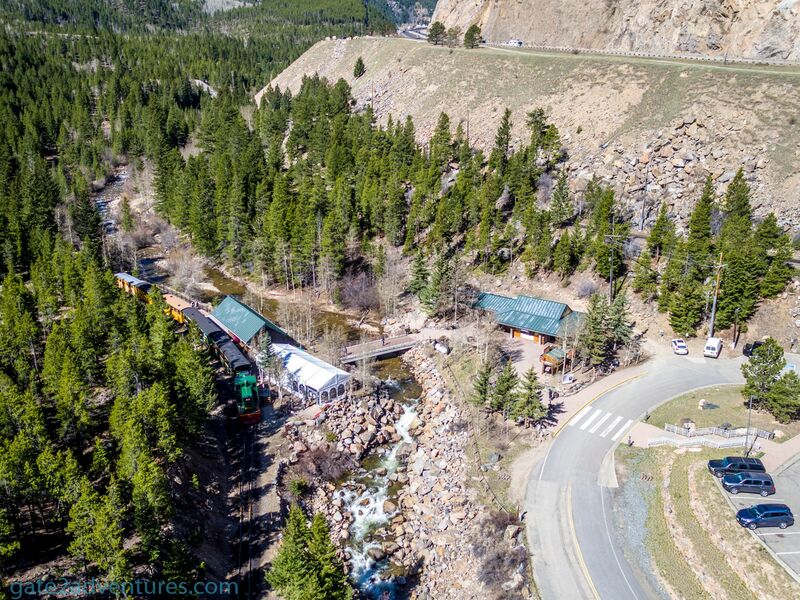 Can you find the Brewery Spring which used to supply water to a local brewery in Silver Plume? The brewery is long gone but the spring remains. On your way, you will also pass the historic Silver Plume Jail. A historic landmark but abandoned jail now. From the door, you get a good luck inside and how a jail looked like in the 1880’s.